Under its imposing Mount Ainos with its unique pine trees, the enchanting shores of the island stretch out with golden sandy beaches that are unforgettable to those who visit them. The dense road network designed at the time of the British rule allows the traveler to know the island. The variety and interchange of the scenery, with its lush vegetation and wild beauty impress the visitor. The towns and villages have come alive again following the disastrous earthquake of 1953 that had raged everything to the ground. At its northernmost past, the older settlements have withstood the fury of the earthquake, therefore the past is joined with the present. Buildings of rare architecture show the beauty of another era. Of course, you should start your trip to the beautiful island of Kefalonia from its capital city, Argostoli. It is located in the centre of the southern part of the island at the far end of the bay with the same name. It was destroyed completely by the 1953 earthquake along with its old mansions and majestic bell-towers. You enter the city by passing over its pretty stone bridge decorated by the Colona, a small pyramid, a monument dedicated to Charles de Bosset, who built the bridge. You see a modern city mirrored in the quiet water of its natural harbour with new buildings, such as the Administration Building, the Archaeological Museum, the Public Library, the Court House, the Municipal Theater etc. One of the largest provincial stadia is the Stadium of Argostoli, , a present from Roccos Vergotis, located at the edge of Koutavos Lagoon. You continue your way along the coastal road, where you can see the market place of fruit stores and fish shops. Don’t miss the chance to take a walk along the marvelous seashore sidewalk with its palm trees and paved with sea pebbles. You can see the sail-boat of summer visitors moored in a row. Turning left, you arrive at the main square where you can see the fine patisseries, restaurant and hotels. Here, in the evening, you can enjoy your cake or ice-cream and if you are lucky, you can hear the sweet musical notes of the Argostoli Band. Don’t forget to walk along the Lithostroto (Cobbled Road), the main street of the city. Here, you can do your shopping at different stores. You can see the church of Saint Spyridon, and the clock tower of Campana Square, where the Kefalonians buried the Libro d’ Oro in 1797, upon the arrival of the French republicans. You can visit the Argostoli Archaeological Museum and admire the archaeological finds of the Mycenean period, ancient gold coins, copper swords, sculptures and ceramic. Something that will be unforgettable to you is the Folklore Museum, located on the ground floor of the Corgialenian Library. Here, you will be transported to another age, vanished with the passage of time. You can admire the superb lace, the linen with family monogram, the living room with the dance gowns, personal things, furniture, silver sets, the Kefalonian bedroom, agricultural implements etc. Then, you can go up to the imposing Library consisting of 50,000 books and you may ask to see the Icon collection of P. Harocopos, and the wood carved icon screen of Sarin. A little further on from the Library you come to the Theatre, built at the site of the old theatre before the earthquake. It is an excellent building, and one of the best theatres in Greece. Following the large palm tree lined street, you reach the building of the Argostoli Music Band School, and little further down you can see one of the very few mansions that survived the great 1953 earthquake. It is the home of Mr. Marinos Cosmetatos that preserves even today, the furniture and decoration of an authentic mansion. Continuing your way, a distance of about one kilometer from Argostoli, you come to Katavothres (Swallow Holes), an inexplicable geological phenomenon. The sea water seeps into the ground and vanishes. Scientists have discovered, by throwing paint into the water, that it ends up in Melissani Lake at Karavomylos, about two kilometers from Sami. You can swim at Fanari, the beautiful shallow beach that starts from Katavothres and ends at the picturesque Lighthouse of Saint Theodore. Fanari is one of the five works built by the British Governor Napier. It is a small round building flanked by white Dorian style columns. Here, you can enjoy one of the most enchanting sunsets. Going a little further up and left, you find the Monument of the Italians, dedicated to the memory of the Acqui Division, whose soldiers and officers were executed by the Germans on the island (about 7,000 Italians). The panoramic view you can see makes you forget that sad event. The tour of Lassi leads you now to the shores of the area. First you meet Kalamia, Gradakia, and Paliostafida, to end up at the marvelous beach of Makrys-Yalos, with its golden sand and very clean water, one of the finest on the island. A rock separates it from the organized beach of Platy-Yalos with tents, showers, a restaurant etc. this beach has the distinction of winning the <> from the European Union. For those who prefer a tranquil environment there is the beach of Tourkopodaro across from there. Continuing your traveling to the Southern part of Kefalonia, you enter the Leivatho region beginning at the village of Minies. The airport is located here and it can accommodate international flights. Then you pass through the village of Svoronata, where there are the beaches of Ammes and Ai Heli. At Domata, you can stop at the Church of Panagia (Our Lady), with its marvelous gold-plated icon screen and the temporary coffin of the Patriarch of Constantinople, Gregory the 5th. At the lower part of the village of Kalligata there is the beautiful beach of Avythos. Nearby is the isle of Dias, with a chapel dedicated to the Panagia of Vlahernon (Our Lady of Vlahernon). Then you arrive at Kourkoumelata, an exquisite modern village with many villas, garden with very beautiful flowers along the planned street, a stadium, and Cultural Centre. It was built according to Swiss building standards by the benefactor G. Vergotis. Lord Byron stayed in Metaxata for a short time before he went to Mesologhi. He used to enjoy the view a little further up the rock at the site of Kallithea (Fine View) of the village of Lakythra. Lakythra is the capital of Leivatho, a big village with nice houses, squares and broad streets. An exquisite museum is housed in Saint Andrew’s Monastery of Milapidia, with Byzantine icons in it. Saint Andrew’s right sole is kept here. To the right of the Monastery are located the villages of Keramies, Pessada and Spartia. In Keramies, the mansions of the Vallianos family stand out. As a gift from the Vallianos family there is the high school of the village which consists of very fine complex buildings. From Pessada, you can easily go to Zakynthos (Zante) by taking the ferry-boat ay the port. At Mazarakata, Mycenian graves have been discovered by the Greek archaeologist Mr. P. Kavadias and the Dutch archaeologist Mr. Gekop. These findings are kept at the Archaeological Museum of Argostoli. The fortress of Saint George rises above the village of Peratata in an imposing way. It was the first capital of the island until 1757. It covers an area of 16,000 square metres and a perimeter of 600 metres. Its shape is polygonic and it consists of three parts: the outer wall, the inner enclosure and the rocky top at the centre of the enclosure. There are ramparts, embrasures and watch-towers. There are many buildings inside the fortresses, such as storehouses, quarters, a hospital and prisons. There were also splendid churches, such as the churches of Saint Nikolas, Saint George and four catholic churches. A tunnel started from the ramparts and ended up at the Koutavos lagoon in Argostoli, serving as an emergency exit. It is really worth visiting. Crossing the villages of Peratata, Poriarata, Mousata and Vlachata, you come down to Lourdata and you arrive at the marvelous beach of Lourdas. It is a sandy beach with many small eating houses and many visitors, ideal for sea sports. Going up again to the main road, you reach the villages of Simotata, Platies and, at the crossing you turn right and pass through the villages of Hionata, Valeriano, Thiramona, Mavrata and you end up at Katelios. Here, you can find fresh fish and local wine. The continuing beaches offer a quiet swim. At the beach of Ratzakli you can find the Carretta-Carretta turtles which lay their eggs in the sand. The next village you come to is Scala. Here is a vast sandy beach with small pebbles and tall pine trees. It has colorful small eating houses, bars, modern hotels and many shops. The villa of a well-to-do Roman, with warm water baths was discovered here in 1957. There are mosaic representations and inscriptions of the 3rd century A.D.
Get back to the main road and stop at the village of Markopoulo. Here is the church of Our Lady. On August 15, you will be amazed to see small snakes with the black sign of the cross on their heads which appear on Our Lady’s feast day and fill the yard, the bell tower and Our Lady’s icon. The worshippers are photographed together with the little snakes, considered as sacred. After the feast day is over, the little snakes disappear and return again the next year. Continuing your way to Poros, you arrive at the village of Kremmydi (Onion), Pastra, Saint George, Saint Irene, Tzannata, and you end up at the very green straits of Poros. Here the landscape is lush and reminds one of the Valley of Tempi in central Greece. Poros is one of the main seaports on the island, a beautiful town that combines both mountains and sea. It has a great tourist attraction with many hotels, restaurants, bars, cafeterias and fish taverns. Its modern square is next to the beach and it has athletic facilities for volleyball, tennis, basketball etc. A Mycenean grave has been discovered in recent years with many funeral gifts in it, by the archaeologist Lazarus Kolonas. 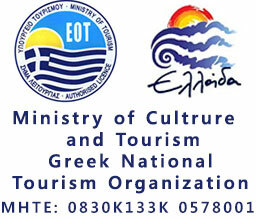 During the summer you can attend various interesting cultural activities taking place at the Poros Community Hall. At an elevation of 800 metres, near Tzanata, is the Atro Monastery. Here, you can enjoy marvellous view and the sunrise. You are now in the Pyrgi area, in the central part of the island’s area. In the village of Saint Nicolas, you should stop to see the Lake of Avythos or Akoli. On your way, you will also pass the mountainous villages of Kapandriti, Xenopoulo, Andriolata and Kambitsata. As far as here, you have passed through the entire southeast area of Kefalonia and now take the road of return to Argostoli. Now it is your turn to visit the Saint Gerasimos Monastery, located on the Omala Plateau. You leave Argostoli by crossing the bridge. You go uphill to the right and arrive at the village of Razata. Here, to the right is a dirt road leading to some Cyclopean Walls. You can look closely and continue your way along the uphill road to Saint Gerasimos. At this point, the view is fascinating as Argostoli and Lixouri stretch out behind you. Before you arrive at Omala, you pass through very green vineyards with the Kefalonian grapes from which the famous wine of the island is made. You come to the village of Frangata and Valsamata, you pass through the Plain of forty wells, and you arrive at Saint Gerasimos Monastery. Was built in the 16th century. The monk Gerasimos Notaras, from Trikala, in the province of Corinth, lived and led an ascetic life here, until his death. He is the miracle making patron saint of our island. Thousands of visitors venerate the relics of Saint Gerasimos. These relics are in the new church that was built after the 1953 earthquake. His feast day is celebrated on August 16 and October 20, and then, a big procession takes place. Now, go up again to the main road and continue your way to Sami. The continuing uphill turns on the road will take you first to the highest mountain of Kefalonia, Ainos or Monte Nero, as the Venetians used to call it. Advancing toward the top, you pass through very green forests consisting of Kefalonia fir-trees. It is a unique species of fir-trees in the world. From here the view is something special. The whole island stretches out at your feet and far away, on the horizon, you can make out the mountains of Ithaca and the Peloponese. It is worth seeing the sunrise. Back on the main road and you go downhill towards the colorful seaport of Sami. You should stop at the Cave of Drongarati, by turning left, in order to marvel at the stalactites and stalagmites, formed drop by drop many years ago. You arrive at Sami, one of the bigger ports on the island where there is a daily ferry-boat service to Patra, Ithaca, Italy etc. Restaurants, bars, cafeterias and fish taverns with delicious food stretch along its wonderful seaside road. It is worth visiting the marvelous beach of Antisami, with its very green and spotlessly clean water. Those who choose to take their holidays in a trailer (caravan) can stay at the organized camping site of Mr. Valetas, located at the beach of Sami, next to the sea. Near Sami is the village of Karavomylos. Here you can go boating on the enchanting Melissani Lake, with its beautiful colored water that turns blue at noon time. The water from katavothres (Swallow Holes) of Argostoli ends up at this point. Continue your way to the colorful seaside village of Aghia Efimia. Along the way you pass very beautiful little bays with white pebbles in them. You can take advantage of the opportunity to swim at some of them. Sail-boats from all over the world anchor at Aghia Efimia. In its fine taverns you can find the delicious Kefalonian specialties which you can enjoy, and at the same time look at the sea and Ithaca in the distance. You are now in the area of Pylaros and come to the villages of Drakopoulata and Makriotika. At the village of Potamianata, is the statue of Marinos Antypas who lost his life in Kileler, Thessaly. When you get the main crossing, you can return to Argostoli by turning left. If you are not tired, you can continue your way to the right towards the very green area of Erisos. To your left, beneath the village of Divarata the unique beach of Myrtos stretches out. Its crystal clear water changes color all the time. A little further down is the Venetian fortress of Assos, next to the small colorful village with big plane-trees. Go downhill to enjoy this rare grandeur closely, a real creation of both nature and man. The fortress was a fortification of the Venetian army and was built by the Venetian Governor of Crete, John Montenigo and the engineer Marino di Gentilini d’ Este. It had a great strategic value together with the port of Assos, where the Venetian galleys used to moor. Go up to the main road again, and continue your way to the north part of the island, in the area of Erisos. Here, you can see a prevalence of lush and plentiful vegetation consisting of cypress trees, olive trees and arbutus bushes. Marvelous village that retain the beauty of another era crop up among them, because this area was not destroyed by the great earthquake of 1953. Starting from Ano (upper) Erisos, you arrive at the villages of Patrikata, Karya, Komitata, Niohori, Vary, Playa and Mesovounia. In Vary, you can see the excellent church of Our Lady with its significant frescoes. Go down to Kato (lower) Erisos and after you pass through the villages of Konidarata, Mangano and Antypata that stand out with their old houses, you get to Fiscardo. Here, you think time stood still many years ago before the great earthquake when all of Kefalonia was built with traditional homes. Fine mansions with red tiles on their roofs and small iron balconies show the beauty of that period. Picturesque taverns by the seaside offer you fresh fish. At the same time see the island of Ithaca across the sea. History tells us that the village of Fiscardo got its name from the pirate Roberto Guiscardo, who managed to moor at the port of Fiscardo in 1185 and conquered Kefalonia. He stayed there until his death. The port was greatly developed during the Venetian period. It was then that the first mansions still surviving were built. Many sail-boats from all over the world moor here so that the visitors would see the picturesque village. There is also a good ferry-boat service to Ithaca, Astakos and Lefkada. As you take the road of return to Argostoli you come to the village of Angona, with its beautiful beach of Aghia Kyriaki. At the crossing, to the right, the road takes you to the Lixouri area, but if you do not want to go by road there is the alternative of the seaway. You can take the ferry-boat from Argostoli. There are regular services every half hour and you can get there in 25 minutes. Lixouri is the second largest town of the island after Argostoli, with about 4,000 inhabitants. It is a picturesque town that was rebuilt after the1953 earthquake. In Lixouri, you can see the Vallianos Vocational School that used to be famous throughout Greece. There is the Music School and the Iakovation Library, housed of in the mansion of the Typaldos and Iakovatos families. You can sit in its main square and taste some exquisite traditional Kefalonian cakes and walk on its picturesque seaside promenade. Here you can see the statue of Andreas Laskaratos, the great satirical poet and prose writer who was one of the greatest celebrities that our island has produced. In Lixouri you can find modern tourist facilities that can offer you an unforgettable vacation. There are plenty of shops, restaurants, eating places and night clubs. For swimming, you can choose the beautiful beaches with red sand located between Lepeda, Xi and Kounopetra (Moving Stone). At this point you’ll find the famous Kounopetra (Moving Stone), a strange phenomenon on the island, but that stone has stopped moving since the 1953 earthquake. Look for the road to the left after Kipouria to Plateia Ammos. Not for the faint hearted. The steps are many and steep, but the visit down to the beach is worth the effort-“The new Myrtos”! It is worth visiting the Monastery of Kipouria. The view towards the open sea is fantastic. A little further away you will find the fine beach of Petani. On the way you pass the villages of Havriata, Havdate, Favata, Monopolata, Kaminarata, Rifi, Damoulianata, Aghia Thekli and Kondoyenada.